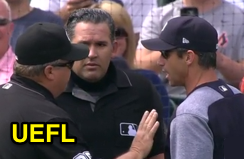 1B Umpire Fieldin Culbreth ejected Tigers Manager Brad Ausmus (denied Replay Review - exceeded 30-second time limit) in the bottom of the 1st inning of the White Sox-Tigers game. With one out and two on (R1, R2), Tigers batter Victor Martinez hit 2-2 slider from White Sox pitcher Miguel Gonzalez on the ground to second baseman Yolmer Sanchez, who threw to first baseman Matt Davidson as Martinez arrived at first base. Replays indicate Davidson caught the ball and tagged first base prior to Martinez's arrival and that Ausmus took longer than 30 seconds in determining whether to challenge the play (replays indicate he took approximately 39 seconds to decide), the call was correct. * At the time of the ejection, the game was tied, 0-0. The Tigers ultimately won the contest, 10-1. This is Fieldin Culbreth (25)'s second ejection of the 2017 MLB regular season. Fieldin Culbreth now has 9 points in the UEFL Standings (5 Previous + 2 MLB + 2 Correct Call = 9). Crew Chief Fieldin Culbreth now has -3 points in Crew Division (-4 Previous + 1 Correct Call = -3). *MLB introduced a 30-second time limit for Replay Review challenge decisions prior to the season. This is the 60th ejection report of 2017. This is the 32nd Manager ejection of 2017. This is Detroit's 2nd ejection of 2017, T-1st in the AL Central (CWS, DET, KC, MIN 2; CLE 0). This is Brad Ausmus' first ejection since August 27, 2016 (Mike Everitt; QOC = N [Balls/Strikes]). This is Fieldin Culbreth's 2nd ejection of 2017, 1st since June 1 (Terry Collins; QOC = Y-C [Interference]). Wrap: Chicago White Sox vs. Detroit Tigers, 6/3/17 | Video via "Read More"